Frank V. reported an issue with linking C++ libraries which I confirmed. I just issued a new pull request for mbed exporters with the fix. In case you followed my last tutorial for CoIDE & mbed, this might be helpful. from UserEditLinker in the xml file or just from Misc control in the IDE. The path to look for mbed library is already there thanks to using ld file which adds it to the linker searching path. I tested this setup with cc3000 udp server demo. I added KL05Z exporter for CoIDE, can test it using project.py. There is also LPC1768 present, but currently has problems in CoIDE with CMSIS-DAP (due to the bootloader), so it's not enabled yet. I decided to start contributed to open source one year ago, as my start project I selected CoX library. I was pleased with CooCox CoIDE back in those days, it's light, easy to set-up, fast and was reliable. However, I abandoned CoX library since than as well as their IDE named CoIDE. This tutorial brings back CoIDE to my life as GCC is supported to all available Freescale targets. I am running this tutorial on KL25Z, but as I checked, also NXP chips are supported there so this should be applied to more mbed targets than just KL25Z. I ported CMSIS-DAP to many new freescale chips, now also bootloader is available. I was looking for open source IDE with working debugger. Finally, found something which is fast, reliable, and works with just few steps. 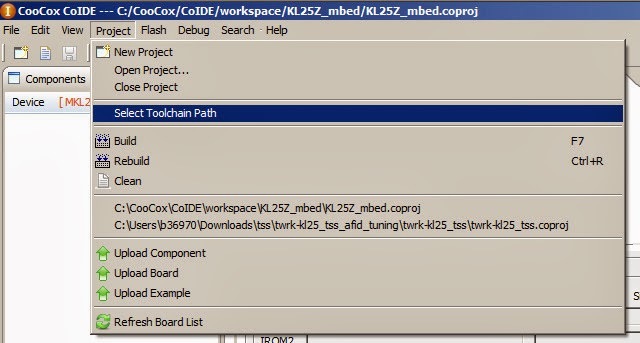 If you want to test mbed with KL25Z in CoIDE, download the project here Hello world project KL25Z CoIDE [mbed.org/media/uploads/Kojto]. I'll explain below how to create your own project, so you can change anything you like like adding your own sources, libraries. In the same tab as Select Toolchain Path, there's New Project (the top selection). Create a new project, select a name and click next. I use KL25Z_mbed as name of the project (which will be used in some steps, so might follow the same). The chip which is assembled on the freedom KL25Z board, is MKL25Z128VLK4. Then click Finish. The project is created and should be visible in the right bottom corner. This creates an empty project with one code file (main.c). Please remove that file. Export a basic hello world example from the mbed site (GCC export option), as reference this one Hello world example [mbed.org/users/simon/code]. Add it to your online compiler and export it to GCC. Unzip the exported Hello world anywhere. The example has only main.cpp file and the mbed folder which contains mbed library with header files + some object files. We need to copy those files to our new created project's folder. There is already .coproj file which gets created later, so don't get surprised by the below picture. After copying them, we go back to CoIDE where we need to set-up our new project. Click on the project with the right-button on your mouse, and select Configuration. This is the crucial step, to set up correctly gcc project. There are few tabs : Device, Compile, Link and more. We could add those defines up there to Defined Symbols, does not matter though. This should be for compile tab, move to the Link tab. The important detail here is to uncheck Use Memory Layout from Memory Window and add linker script path (scatter file). The last thing to check is Debug tab, where select CMSIS-DAP, SWD and 1MHZ (this should be set as default for that chip). Now press F7 (BUILD) which builds the project. 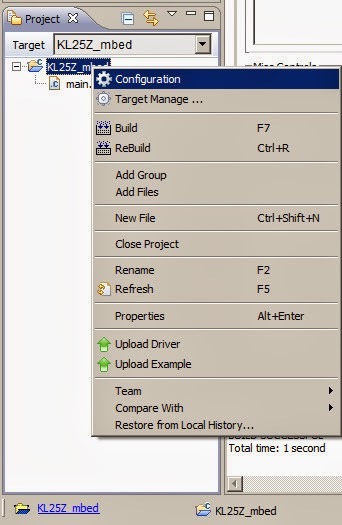 It should display BUILD SUCCESSFUL if everything is correct along with size of the each areas and the command invoked. Connect your board which mbed interface (CMSIS-DAP) and click on Debug icon (or press CTRL+F5). Debugging starts, it puts the breakpoint inside the main function, as it's shown in the picture below. Happy debugging ! I am surprised with a speed, compared to pyOCD I tried with eclipse, this is really quick. I will find out when other mbed chips are going to be supported. Update1: I am currently working on an exporter to CoIDE for KL25Z, and probably later also other targets will follow. The freedom platform and some tower boards contain openSDA circuit. OpenSDA is managed by Freescale Kinetis K20 MCU (Cortex -M4). It is claimed to be open-standard serial and debug adapter. It's not by "all" means, because the P&E bootloader can't be reprogrammed, as the chip is locked. Thus CMSIS-DAP interface was used on top of P&E bootloader. 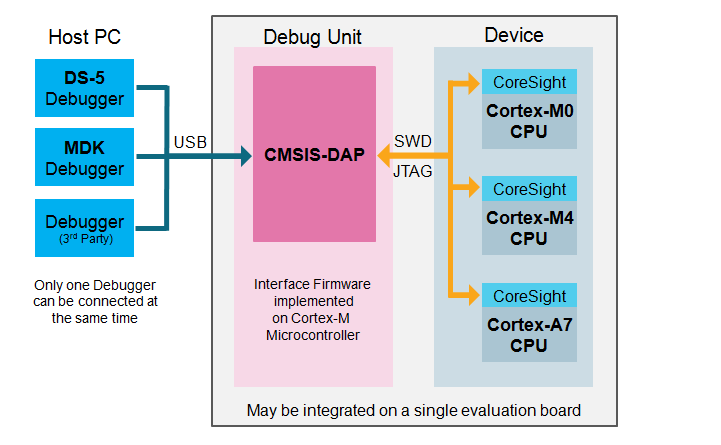 CMSIS-DAP is the interface firmware which connects the Debug Port to USB. It consists of a debug unit and a device, both are usually assembled on a single board. I was porting bootloader for K20 the last 3 days. As result, I sent yesterday a pull request to CMSIS-DAP repository (consider it's the first initial version as it's not yet on master branch), which means that the circuit openSDA (K20) will have full CMSIS-DAP support. You can freely design your boards which could use CMSIS-DAP (bootloader + interface). I will describe CMSIS-DAP more in the following days.